UPDATE 1/11/15 - Sad News. UPDATE: 1/10/15 - First Egg! To begin, the Sprocket household has been under the weather. Mr. Sprocket is back to work today after a four day stint as sofa king. He's not 100%, but four clients needed service calls and he is a bit better. He's been battling something in the back of his throat. He never coughed, he never got a fever, but he felt miserable and weak all over. I've also been on the edge of something myself but not nearly as bad as Mr. Sprocket. I had to cancel dinner plans tonight with beloved friends and I'm trying to save my energy for a hearing in the Michael Gargiulo case tomorrow morning. It could partly be due to my sleep schedule being totally out of whack from late night sewing. I'm trying to work out the design problems of my new Hot/Cold Pack, the Shoulder Wrap. I hope to have these up on my Etsy store, soon. Two days ago, I was in the back yard putting up fresh hummingbird food when I happened to see, high up in the rhododendron bushes along the fence, a momma hummingbird with a bit of fluff in her beak. My heart soared. I knew there was a nest nearby. 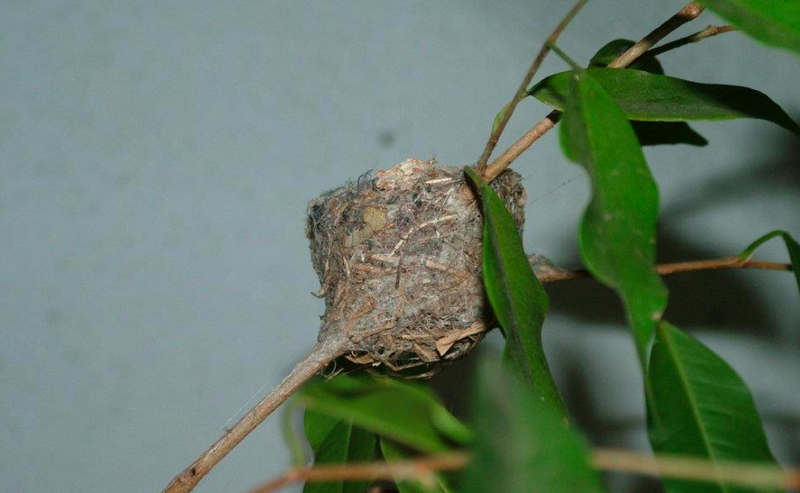 Back in 2012, right before the start of the Stephanie Lazarus murder trial, I discovered a hummingbird nest in a ficus tree on my back patio. I've had several other hummingbird nests on the property since, but I like to think that it was Sherri Rasmussen's spirit that nudged that hummingbird to build her nest there, right by my patio window at that time. The joy that nest brought me was a comfort during the difficult days of attending that trial. To this day, every time I discover a new nest I think of Sherri, and all the promise her life held. I was hoping the new nest wasn't 15 feet up in the cactus-type trees in my neighbors yard, but in the rhododendrons where I've had several nests since 2013. Two trees, home of hummingbird nest retreat. Today, I went out and started searching. I knew there was a nest because momma would not shut up. She was chirping like a nervous nellie when I stood in front of one particular tree. I first found an old nest that I completely missed last year. It is in the tree on the right. I could tell it was an old nest because there was a dead leaf over the nest and the nesting material had hardened. Active hummingbird nests are amazingly soft to the touch. I removed the leaf and took some photos. Can you see the nest in the photo? Can you find the old nest in this tree? As momma kept chirping I kept looking for the new nest. About ten minutes later I found it. First Nest of 2015 "Loft Nest"
Unfortunately, it's about 10 to 11 feet off the ground and will be difficult to photograph the babies once they hatch. It will also be difficult to help protect this nest with plastic if we get another hard rainfall. Here are a few close ups of the nest. I started to wonder if there were eggs in the loft nest, so dragged myself outside again. I pulled out the 7 foot step ladder to look inside the nest. The nest is about 9.5 feet off the ground. Loft Nest: No eggs yet! I'll keep everyone posted as to Mrs. Loft and the progress on her nest and eggs, once she gets around to laying them. At the first sound of a light rain on my roof, I went outside to put a clear cover over the Loft Nest. I've placed this same type of vinyl over two other nests in the past. When I got up on the ladder I peeked inside. Sometime between 2 PM yesterday and 9 AM today, Mrs. Loft laid her first egg. Her second shouldn't be far behind. Sad news on Mrs. Loft's nest. Although we did not have a very hard rain all night, it was constant. When I went to check the Loft nest a few minutes ago, from the ground it looked intact. However, when I climbed the ladder to the nest, there were no eggs. The nest was damp to the touch and there was a section that had broken away. I found a partial eggshell on the ground near the ladder. I will improve the cover over her nest in the hopes that she either tries to reuse it or will use the material in another nest construction nearby. Thank you for the update. Oh, I was so looking forward to seeing photos of baby hummingbirds. My best to Mr. Sprocket for a quick and through recovery.